A COMMUNITY CALLED "MONEY," THEN RENAMED "ETOWAH"
it is the first official post office created on May 24, 1889 that establishes the year of origin for this community. How does history identify the year of origin to mark the beginning of a community? ​Is it a small group of farms in proximity to one another? the first church? the first school? the first cemetery? the first general store? the first post office? the building of a train station? At what point in the story does one say, this is the beginning of our community? And with what supporting material or documentation? In the case of a rural community where there is no official governing town or village charter, the establishment of a post office is accepted by most historians as the point of origin for the community. ​In order for a postmaster to be appointed, some degree of community already had to be present. In other words, a number of farming households in proximity to one another had become established over time. ​​What do we know about the origins of the Henderson County community we call "Etowah"? ​For ten years, from 1889 to 1898, the community's first post office was called "Money." 1889 Money Post Office, the community's first post office located along Brickyard Road and first postmaster, James A. Collins (1848-1929), appointed May 24, 1889. 1895 Train Depot built and named "Money," then changed to "Etowah." The Hendersonville & Brevard Railway Company built the train station in 1895, named it Money by default, and then changed the name to Etowah, most likely within the year. No company record of the name change has been found to date. 1898 Post Office was officially re-named "Etowah" on March 30, 1898. P. O. located in a store owned by John W. Jeudwine (possibly along Etowah School Road near Misty Mountain Drive, to be verified). ​​By 1898, when the U.S. Post Office changed the name, the Money Post Office had already had four different postmasters (Collins, O. Greer, H. Greer, J. Laughter) and had moved several times as the postmaster changed. Collins served in the Union Army during the Civil War - Co. B, 10 Tennessee Cav. He married Margaret 'Maggie' F Hollingsworth. Maggie died in 1898. She is buried in the Davidson River Cemetery (to be verified). In February 1888, Collins purchased 125 acres "lying on either side of Burn's Creek" from J. L. Gash and W. A. Gash, Exec. of L. S. Gash and M. A. Gash. (Henderson County Deed Book 24, page 164.) 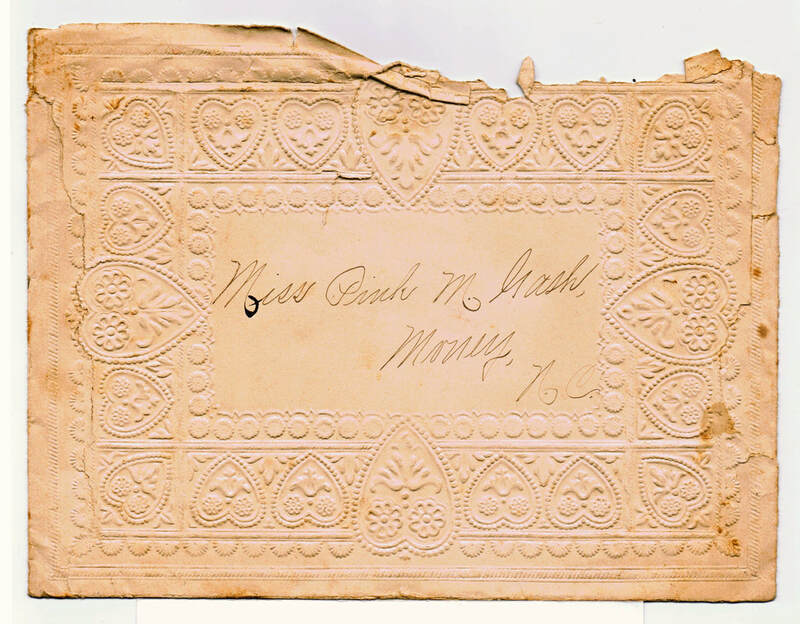 He sold that same parcel in 1899 to F. W. Nicholson, about a year after Maggie died. (Deed Book 39, page 44). - Early 1800s - John and Jane Clayton Orr built their home and farm along what is now Etowah School Road. - Burns Creek (1830), Hopewell (1868) and Oak Forest (1876) schools were built. - Pleasant Grove (1859) and Old Beulah Baptist Churches (1815) were established. - Alfred Raney and Mary Livingston Gash, married 1829, farm and home was located along Gash Rd (off Holly Springs Rd / Turnpike Rd). - The Robert Thomas family homestead was across the river in the 1860s or earlier. - Early graves in the Oak Forest Cemetery date from 1876, 1884, 1886, 1893 (2), 1894, 1895. - 1883 - Nearby, Bowman's Bluff postmaster, William Hamilton Blythe, was appointed in December 1883. The Welsh Colony was established, arriving sometime in the 1870 - 1880s. - Between 1870 and 1890, on both sides of Old 64, a number of homesteads were well established around the Money Post Office locations. The above 1913 map of Rural Delivery Routes above shows the approximate location of the Collins property on the road known today as Brickyard Road. 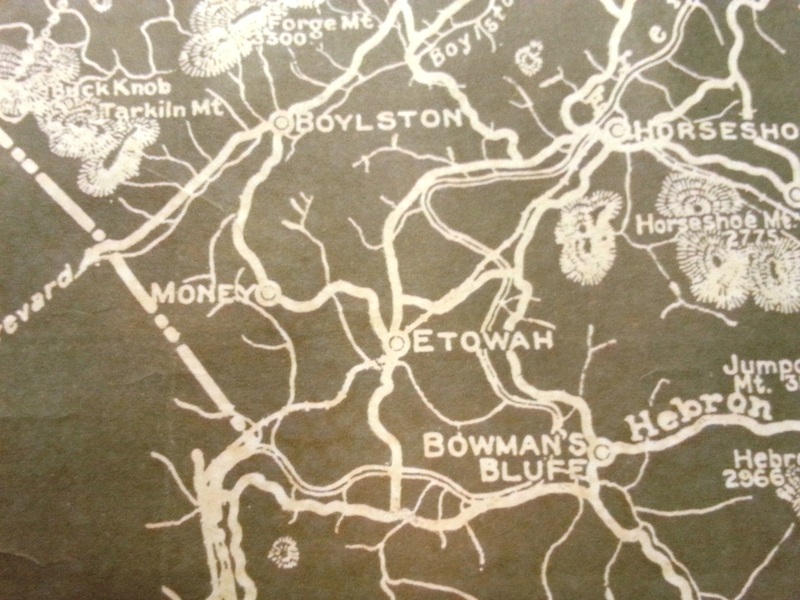 A close-up from the 1918 Henderson County map, showing both Etowah and Money. ​This 1918 map shows the general location of both Etowah, Money, Bowman's Bluff and the Henderson/Transylvania county line. Map by Geo. Kershaw, Eng'r & Surveyor. Courtesy of Henderson County Genealogical & Historical Society. From Lenoir Ray's 1970 book, "Postmarks,"
​"James A. Collins either had a wry sense of humor or was obsessed with one subject when he named his post office Money on May 24, 1889." "Postmaster Collins operated a store about two miles north of the present site of Etowah." Ray's account goes on to state that Collins was postmaster for three years. He was then succeeded by Ozark K. Greer on April 6, 1892, adding that the Greers "operated a store about where the new Etowah Golf Course is located today" [along Brickyard Road]. After the Greers (including mother Rebecca) Ray writes that "he [Joshua Laughter] moved the office a little closer to the present Etowah  location. He also operated a store in conjunction with the office." 4. Pearl Gash's (1883 - 1971) "History of Etowah P.O.," written 1956.